Bumbling guards at the Tower of London are facing the ax after a thief managed to scale the front gate of the 11th century fortress and steal a set of keys from an unlocked strongbox, according to British reports. The keys unlocked a drawbridge, some conference rooms and a restaurant at the complex, and royal officials were forced to have a number of the locks changed, The Sun newspaper reported. The Royal Crown Jewels, which are kept under guard at the Tower, were never at risk of being stolen, a royal spokesperson said. The daring heist took place on Guy Fawkes Night, the annual Nov. 5 celebration that commemorates the break-up of a plot to assassinate King James I in 1605. According to the Sun, the Tower’s traditional guards, known as the Beefeaters, spotted the thief but didn’t chase him because they are forbidden to leave their post. Instead, the guards radioed for help from a night watchman, but were ignored, the Sun said. The Beefeaters, officially the Yeoman Warders, guard the palace along with a private security firm. The box is supposed to be kept locked at all times but it was open. London’s Metropolitan Police were hunting for the burglar, and a spokesman for the Historic Royal Palaces, the independent charity that runs the Tower, said the incident was under review. The castle complex, which sits on the bank of the Thames river in central London, has served several functions in its century-long history. It has been a royal residence, a prison, a treasury, a mint, and the site of a handful of executions. Today, it primarily operates as a tourist attraction. 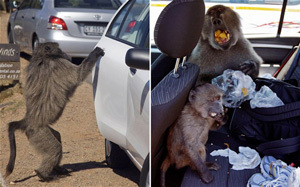 Baboons in Cape Town, the second-most populous city in South Africa, are being paintballed to drive them out of residential suburbs and stop them from pillaging homes and cars on brazen food raids. The animals are shot by monitors who shadow the city’s several primate troops, which are notorious for causing havoc in areas bordering their natural mountain habitat. “It does work, it’s actually fantastic,” said city veterinary scientist Elzette Jordan. However, some streetwise animals have learned to spot white paint and duck when it is fired, forcing monitors to use more colourful options. Cape Town’s mountainous peninsula is home to several protected Chacma baboon troops and bold plunders are frequent. People have been injured in some instances. “Our current strategy is to get them 100 per cent out of urban space,” Jordan told AFP. The paintballs were first trialled at the beginning of the year. Sharks have most people fleeing in the opposite direction – but not Pierre Frolla. The world champion diver from France spent an hour in shark-infested waters without any protection at the Paris Aquarium Sunday. The daredevil swam among 25 of the most feared predators, including 16 blacktip sharks, four gray sharks, three zebra sharks and two nurse sharks, France’s Gentside reported. “The aquarium is in truly unique shape, the fish are very, very calm and we were able to enjoy some beautiful interactions,” Frolla said after the dive. Frolla said he wanted to do the daring dive to show people that they do not need to fear sharks. The 37-year-old diver, who has swam with sharks many times before, said the movie “Jaws” is partly to blame for people’s fear. From London’s Daily Telegraph and The NY Daily News.